India is not the only country with high solar energy goals. However, what India has is unprecedented backing from its government and favorable geographical conditions. The renewable energy industry is one sector where the government permits foreign companies to take the automatic route and allows 100% FDI. Foreigners may invest either as a joint venture or on their own, but do need to comply with the reporting requirements of the Reserve Bank of India (RBI) and other relevant regulations. The Government listed a number of measures it has been pushing various Ministries to support, including building green energy corridors, using satellite to identify transmission infrastructure, setting up parks for domestic manufacturing of modules, and raising tax-free solar bonds among other schemes. India will become one of the world's largest solar energy producers by 2022. In a major decision to boost use of clean energy in India, the union cabinet on Wednesday decided to quintuplesolar energy capacity under the National Solar Mission towards achieving 100,000 MW by 2022. 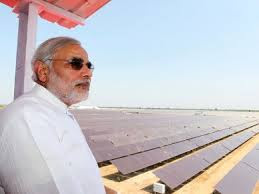 The Union Cabinet chaired by the Prime Minister, Shri Narendra Modi, gave its approval for stepping up of India’s solar power capacity target under the Jawaharlal Nehru National Solar Mission (JNNSM) by five times, reaching 1,00,000 MW by 2022. The target will principally comprise of 40 GW Rooftop and 60 GW through Large and Medium Scale Grid Connected Solar Power Projects. With this ambitious target, India will become one of the largest Green Energy producers in the world, surpassing several developed countries. The total investment in setting up 100 GW will be around Rs. 6,00,000 cr. In the first phase, the Government of India is providing Rs. 15,050 crore as capital subsidy to promote solar capacity addition in the country. This capital subsidy will be provided for Rooftop Solar projects in various cities and towns, for Viability Gap Funding (VGF) based projects to be developed through the Solar Energy Corporation of India (SECI) and for decentralized generation through small solar projects. The Ministry of New and Renewable Energy (MNRE) intends to achieve the target of 1,00,000 MW with targets under the three schemes of 19,200 MW. The new target will give impetus to the Jawaharlal Nehru National Solar Mission, launched 5 years ago. Considering India's horrifying air pollution, solar power is no more a futuristic vision - it is going to a lifesaver. The government's announcement links the solar energy target as an important initiative to reduce reduction over 170 million metric tons of carbon dioxide. At the moment, India gets 4.5 GWs from solar energy. According to consultancy Bridge to India, land acquisition, grid infrastructure, and financing has been holding back India's great solar success story.